After musical performances and an introduction to the day’s events from teacher Lisa Jokivirta, the day’s keynote speaker spoke to a full auditorium. Lars Magne Andreassen is Director of Lule Sami Institute Arran, an Executive Board Member of the Galdu Resource Centre for the Rights of Indigenous Peoples, elected National Representative of UNESCO in Norway, active in the Sami Parliament. 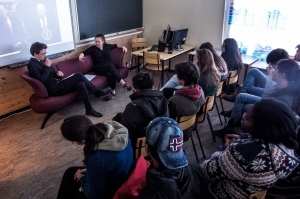 he offered a general overview of both indigenous and settler populations in the circumpolar north and discussed extractive industry developments such as mining in the northernmost parts of Norway, Sweden and Finland. A day of workshops was followed in the evening by the screening of two films about the Arctic, a special dinner – including reindeer meat, and a bonfire with storytelling, snacks and music.. 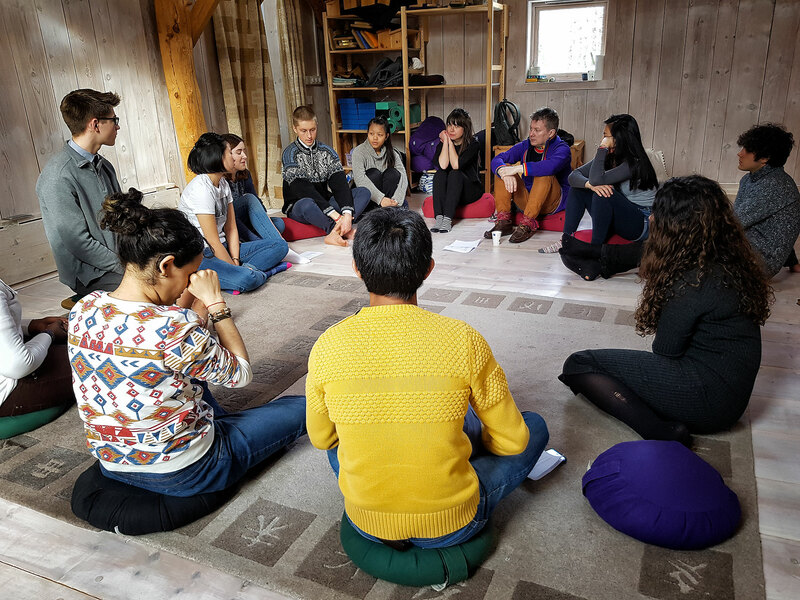 Description: The Partition of the Arctic Conference draws a diverse group of RCN students to address the current state of the Arctic region. Our conference will provide participants with a better understanding of the inner workings of the Arctic Council as well as providing a space to improve skills in diplomacy, critical thinking, and public speaking. No prior research on the topic is necessary. Description: “To mine or not to mine?” Greenland might finally have opportunities to earn some money. The money is buried underneath the ground, in the form of natural resources waiting to get dug up, but should we do it? There will be a debate where you get to decide if mines should rule this vulnerable country as you act as the government of Greenland. In this episode of the smash hit television series, Melting with Moritz, Flekke’s favorite host, Linnea Moritz, will talk about how climate change will affect Alaska. If right now you are thinking, “Alaska? That’s one of those strange American states right?” And if that’s all you know then you should come to this week’s mind-blowing episode! This time Moritz will be interviewing a wide range of guests including, but not limited to, climate scientists, activists and residents affected by the Arctic Climate Tragedy. Through her engaging questions, Moritz will provide all the facts you need to understand climate change in Alaska. You should look forward to an exciting, engaging and humorous show! Description: In this workshop, we will look at whaling and examine what makes it such a controversial topic. Why do some countries still practice it, while others see it as wrong? Is it sustainable, and what might be indigenous perspectives on the issue? You will learn the key facts, and then take part in an active discussion. Description: Focusing on the ambiguity of indigenous people’s political rights, our workshop gives you the chance to learn about the wonderful and yet threatened ways of the Sami people. 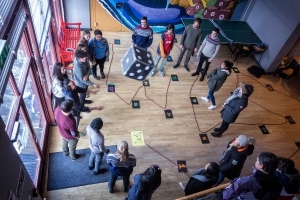 You will learn about the role and function of the Sami Parliament, the Sami Council, as well as the international channels through which indigenous peoples like the Sami might fight for political rights. Challenge yourself through our mind puzzles. May the sharpest memory win. Description: Have you ever wondered what it’s like to be an indigenous person living in the Arctic? Do they still live in igloos? Do they eat polar bear? 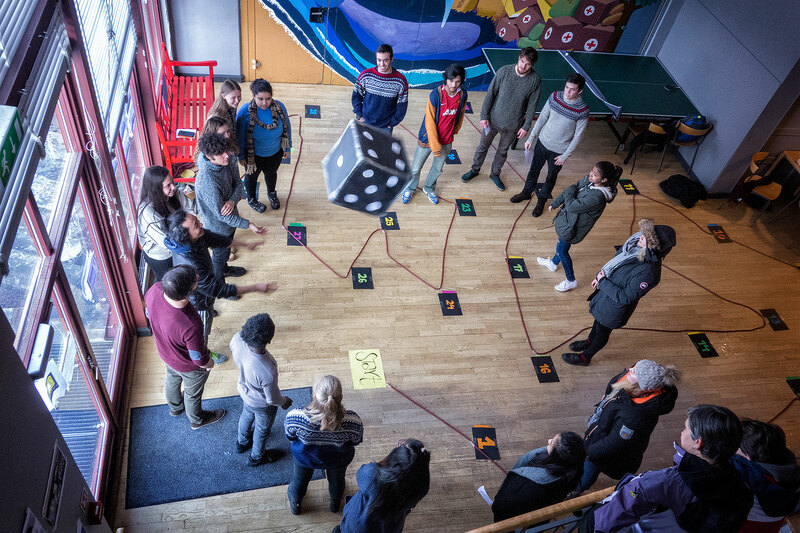 This interactive workshop challenges some of the stereotypes surrounding indigenous peoples, and invites you to explore different aspects of their culture, lifestyle and development, and discuss how they navigate between tradition and modernity in an increasingly globalized world. Description: In the midst of the Swedish forests, a beautiful melody travels through the silence. A lonely woman calls for her cattle over the mountains. Further east, an old man tells a story through sounds coming far down in his throat. 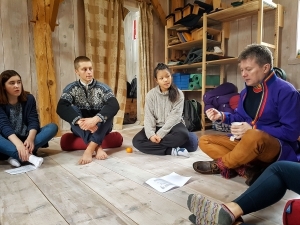 Come and learn the basics of the beautiful, Swedish Herding call tradition, and throat singing. This is an exclusive opportunity and we look forward to seeing you there! Description: An amazing interactive session to give a better understanding of the role of dance in the storytelling of indigenous tribes. We will give you an overview of the history of the indigenous tribes and we will teach you basic dance moves to enrich your skills of arctic body expression! Description: Breaking News! Vikings have returned and taken over Flekke! They are currently inhabiting the island outside of Haugland, and refuse to leave before they give us a taste of their ways. There have been attempts to forcefully remove them, however they seem to be more persistent than they were the first time around. Due to this, we have decided to give in to their demands. We will be sacrificing 20 students to hear their claims and report back to us. This mission will be dangerous, it will take concentration, dedication, appropriate clothing for outdoor activity, sweat and blood. Are you the right person for the job? Description: Anne Hopland, the Director of the Ancient Parliament in our region, comes to RCN as a visiting lecturer to give an interactive talk on the theme of Vikings. Did you know that the Vikings had forms of democratic laws and governance? Anne has in depth knowledge about how the Vikings had democratic gatherings and laws that they took to their new areas of settlement, e.g Iceland and Greenland. Come learn more through Anne, and bring along with you any burning questions about the Vikings that you might have! Description: The interest in the arctic continues to increase, and with it the interest in Greenland. Greenland is for now an autonomous constituent state within the Danish realm, but who would benefit from its independence? And is this really in Greenland’s best interest? 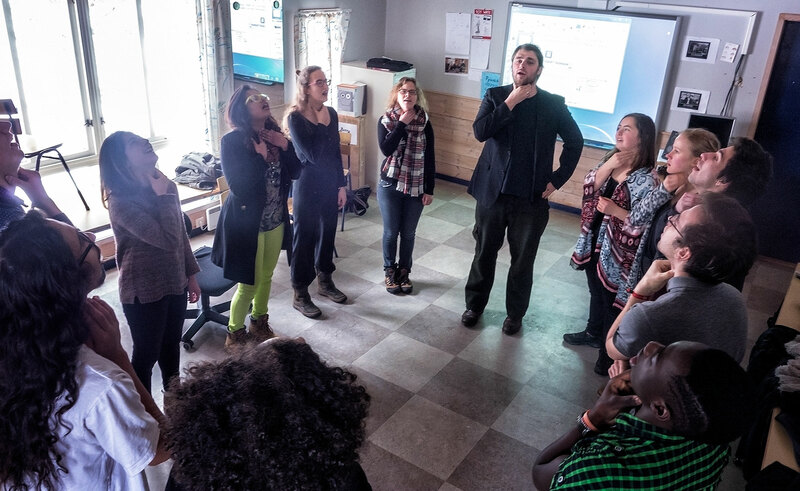 You decide – The future of Greenland is in your hands! Description: This workshop is not like any other workshop, Teo will be squatting in the sauna. We will have a brief interactive (and fun) presentation aiming to introduce the history, development and benefits of the sauna. Through a journey like no other, participants will experience and develop their own mentality of the sauna. After the presentation you will join us in a sauna session where we will discuss the interesting happenings in the sauna in the modern era. It will be hot, get ready! Description: A real-life board game where you will have to work in teams to complete challenges and overcome the difficulties that an Arctic expedition offers, to see who will reach the North Pole, and who will fail. The way is long and dangerous, and you have to expect the unexpected. Do you have what it takes? Join us for the Nordic art workshop where you will have the opportunity to explore Ancient arctic text messages (runes) and Norse decorative art! No prior skills needed, come for a relaxing workshop with snacks, music and Reidun’s art supplies. There are ten distinctive Sami languages in the Sami homeland, nine of which are considered by UNESCO to be seriously endangered or near extinction. Join us in the Silent House for a more intimate sharing circle about indigenous and minority language loss. Our keynote speaker Lars Magne Andreassen will share some reflections about the historical role of residential schools as well as modern-day examples of language assimilation policies and the challenges of ‘saving’ Sami languages up north. This will be followed by a sharing circle where you are all invited to share any thoughts about minority language loss including indigenous, pidgin and creole languages, all are warmly welcome to join. 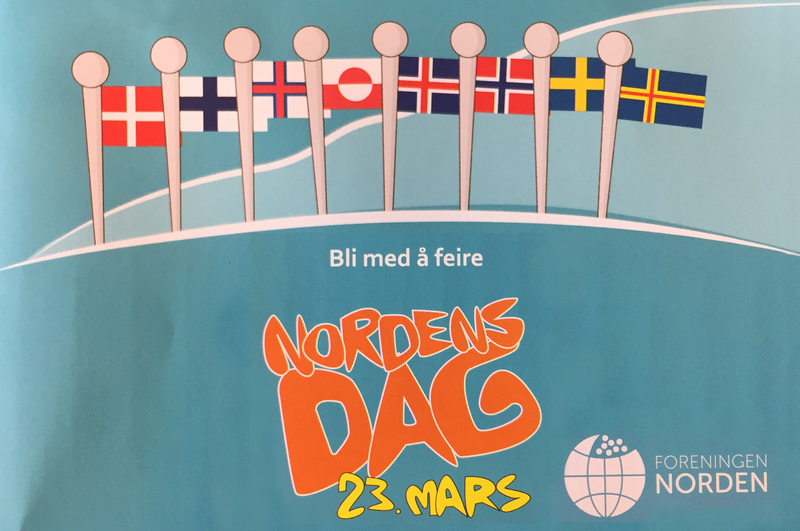 The Nordic Day is coming up on March 23rd, on the date when the Helsinki Treaty was signed in 1962. This treaty forms the basis for the official Nordic co-operation and gives direction for for co-operation within the various sectors of society. At UWC RCN the day will be dedicated to a special event focusing on the far north, which also is the official Nordic event for Fjaler. About the day: see here. The Programme at RCN: see here. 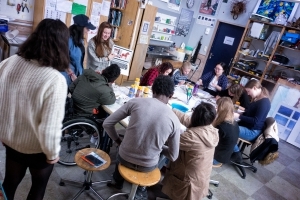 On Friday 17th of March, the students of Nordic Literature and the second year of Norwegian B are going to Dale to see the comical theatre piece The Lesson by Eugène Ionesco. 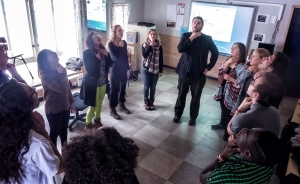 Sogn and Fjordane Theatre is on tour (The Cultural Rucksack) and is going to perform for most High School classes in the area. 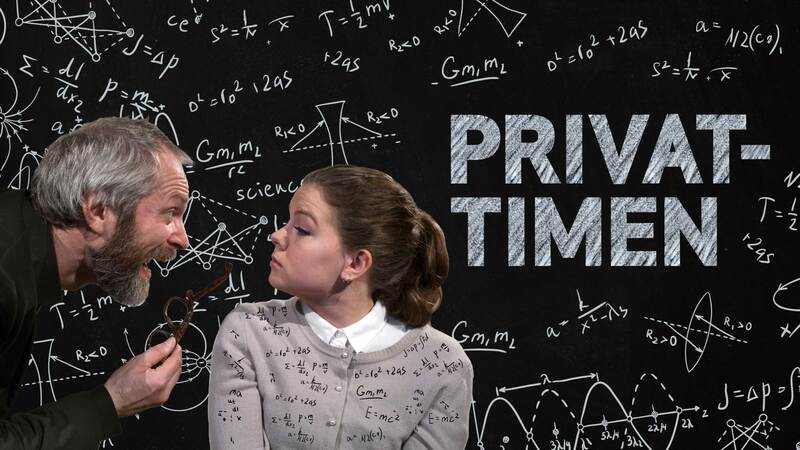 The students will be able to “meet” the student who is supposed to achieve the “Universal Ph.D.” in three weeks, the professor who is supposed to help her with this and his maid. Burlesque and humor-filled drama in one act. The Lesson is an interesting and thought-provoking piece that raises questions about the meaninglessness of the taught and oppressive values that we share. This happens by the story being told in a cheeky, unconventional and liberating form of absurd humor. Who is this young student who doesn’t know more than an eight-year old child? Who is this strange professor who is “hiding” a sadistic tyrant inside and who is this maid who is supposed to tell people about the tragic result of this private lesson? Language as a tool of power. In The Lesson, language is used not only for communication or learning, but also as a tool of power. The piece is written as an attack on an oppressive school system with totalitarian teacher authority. It is full of surprising events and exaggerated, grotesque humor. The writer of the play, Eugène Ionesco, is focusing on the meaningless nature of our conventions. What kind of people are we teaching our children to be? What kind of banal knowledge are we forcing upon them? What use will they have for the hopeless mindset and the useless skills that we are indoctrinating them to have? What are we using our language for: to dominate or to liberate? There are very few people who, after other prestigious academic achievements, continue to list their high school education on their résumés and profiles. In my case, the Red Cross Nordic United World College (RCNUWC) was not simply a high school, it was a place that transformed my life and restored my hope for a life better than the one I was dealt as a child who grew up in war. This is why all my other education is a footnote to Flekke. 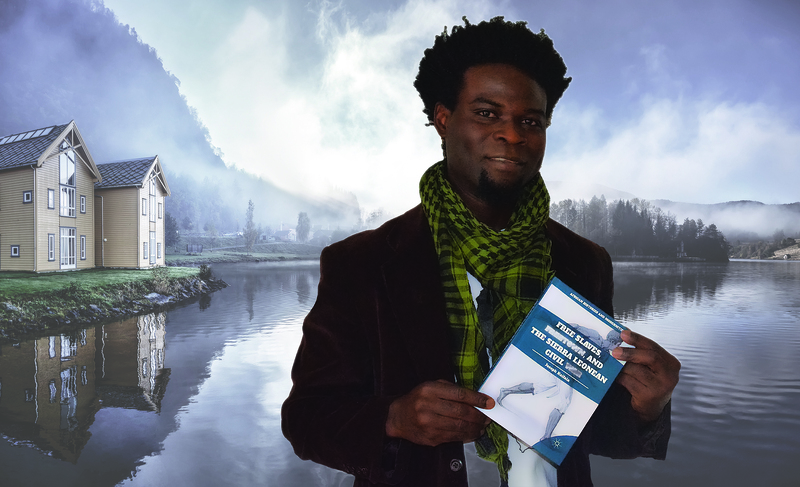 I went to Norway after surviving the Liberian and Sierra Leonean civil wars and living as a refugee in Guinea. My life had been a persistent struggle as a result of conflict and poverty. When I got to Flekke in 2002, orientation for new students was over, but it was obvious that my classmates had been eagerly awaiting my arrival. It was past midnight when the van that took me and another latecomer (Kipsy, Swaziland) to Flekke, but dozens of students had stayed up to welcome us. My roommates had baked a cake and my second year from Sierra Leone, Leonard, had decorated the corner that would be my space. We stayed up for at least two more hours, discussing my journey and the lives of my roommates: Talha (Pakistan), Horacio (Uruguay), Tormod (Norway), and Erik (Sweden). From the information material I had received, I had envisioned RCNWUC as a wonderful institution, but sitting in my room that first night, exchanging stories with students who spoke as though they had known me forever, made me realize that the school was greater than I had imagined. My education before Norway had been in a refugee school system established by the International Rescue Committee and at the Sierra Leone Grammar School. As a result of limited resources, I had very little background in the sciences, unlike other African students who came from relatively stable countries. Therefore, I took an academic path in Flekke that was not usually traveled by other African students. I registered for Philosophy, Theatre Arts, Maths (Standard), Environment Science, and English Higher Level. Other Africans studied higher level sciences and almost all of them took Development Studies. It felt like my failure to take Development Studies kept me on the margins of the inner circle of our Ghanean teacher, Daniel and his wife Barbara, but these two always found a way to share their love and parent me. I arrived in Flekke as a nervous young man, lacking confidence, and afraid of taking chances. My philosophy teacher, Aseem Shrivastava, taught me that it is not the “truth” that really matters, but the journey in the quest for “truth.” Maria Teresa (MT), my English teacher, made me understand that her love for me came with a high expectation of academic performance—and playing Okonkwo. When I hugged MT goodbye on my last day in Flekke, she said: “I look forward to seeing you in the newspapers, Joseph.” As I turned to leave, she added: “Just not in the criminal section!” Every time I came close to being bad in college, I envisaged MT’s disappointed expression as she comes face-to-face with a mugshot of me in the criminal section of the Saratogian. This thought was enough to keep me grounded. Nothing prepared me for activism better than Peter Wilson’s Theatre Arts class. Pete is not a pedantic teacher, so we were allowed to improvise until we were collectively satisfied with our level of artistic expression. This class also allowed me to pursue my interest in studying Wole Soyinka’s Market Theatre. I chose Theatre Arts as my course for the dreaded Extended Essay. I enjoyed Pete’s sense of humor and his willingness to leave room for all students to contribute. I was academically and socially behind many of my classmates in Flekke, so I participated in activities that improved my skills. I did my required service in the library not only to help others find books, but to grant myself ample time to read. My service as a lifeguard at the Haugland Rehabilitation Centre also allowed me to improve my swimming skills. MT and I started a new service to keep our laundry clean. Cleaning other people’s underpants and socks left in the laundry room was a messy job, but I found it humbling, and a relevant training. Though I never became an expert skier – even with the help of Ski Week, or a promising Norwegian Folk dancer (I kicked the hat out of a window during hallingdansen), I was selected to join our team that went to Ridderrennet as volunteers and performers. In later years, I would brag about performing for the Queen of Norway there. I was also a member of the Human Rights club. My major role in the Human Rights club was to coordinate a weekly Amnesty International letter writing on behalf of Prisoners of Conscience. This service was personal because I had been a child prisoner during the Liberian war. It often made me wonder whether my time in jail would have been shorter had citizens around the world written to their leaders on my behalf. When I launched Save the Future Generation (SaFuGe) at RCNUWC to help children affected by war in Sierra Leone, I thought it wouldn’t survive when I left. But the students that came after, with the help of MT, have continued to make me proud. I visit the website every year to read about their annual projects, which now have root in several countries. A small organization established to help the children I left behind in a war-ravaged country has now become a tool for RCNWUC students to shape the lives of people in need in other places around the world. I remain grateful to Henrieke (Netherlands), Nikolai (Denmark), and our late friend, Jonas (Norway), for their help in the early stages of SaFuGe. Moreover, the knowledge I received from the World Today, Global Concerns, Film Night, and Project-Based Learning week, had a great impact on me. I replicated some of these ideas in college and even became head of my Model United Nations, Model European Union, and International Affairs clubs. My experiences at RCNUWC prepared me for the study of International Relations and International Law in the United States. I have recently published a book, Free Slaves, Freetown, and the Sierra Leonean Civil War (Palgrave Macmillan 2017), in which I explore the history of Sierra Leone and the legacy of slavery in that country. I am grateful for the friends I made at RCNUWC, my mentors Alistair and Lesley Robertson, my second year roommates, Siim (Estonia), Bastian (Denmark), Niko (Germany), and Bo (China). My heartfelt gratitude goes to my first year roommates. Nothing illustrates our love better than the unanimous pact to wake up, every morning throughout our year in the same room, to Boris Gardiner’s track, I wanna wake up with you. I play this song from time to time, to remind me of you, and to take me back to that small village in Norway where human diversity and world peace are a reality. For profiles and news of other students and alumni, click here.